This is a very satisfying all-in-one dish: warming, filling and easy to throw together. 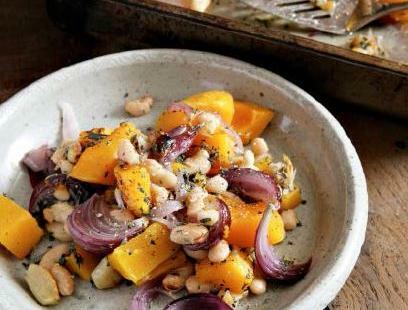 The roasted beans take on a toasty crispness that complements the silky squash and sweet onions. Halve the squash. Peel it and scoop out the seeds, then cut the flesh into 3–4cm chunks. Put these in a large roasting tin. Peel the onions. Leaving the root intact so that the layers stay together, slice them top-to-toe into slim wedges, about 2cm thick at the outer edge. Add to the squash. Peel all the garlic cloves and add these too (or, if you’re in a hurry, just separate the cloves and give them a quick bash with the flat of a knife). veg. Return the tin to the oven, uncovered this time, for a further 10–15 minutes or until all the veg start to take on some golden brown colour. Add the chopped sage to the hot veg and stir well. Serve with some steamed greens or a leafy green salad on the side. In place of the squash, use a 50:50 mixture of potatoes and parsnips or celeriac, peeled and cut into roughly 3cm chunks. After their initial 45 minutes’ cooking with the onions and garlic, add 2 cored and roughly chunked-up eating apples and 1 tablespoon chopped rosemary, along with the beans before the final 10–15 minutes’ roasting. Finish with a scattering of toasted hazelnuts if you like. Any significant leftovers (of either roast) can be whizzed up with a little stock to make a hearty soup (squeeze unpeeled garlic cloves out of their skins before puréeing).